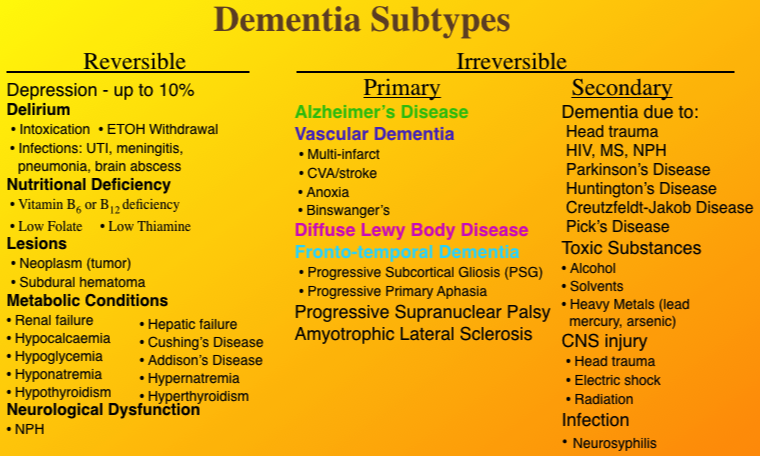 There are many causes (etiologies) of dementia. Some causes can be reversed (e.g., metabolic disorders like hypothyroidism). We can break down the causes of dementia into reversible, and nonreversible etiologies. A nonreversible cause is secondary if the dementia results from an external factor (e.g., a head injury or alcoholism) or primary if the dementia is caused by a disease like Pick's or Alzheimer's. It is important to evaluate the causes of dementia because, in the case of reversible dementias, they can be cured. The first step is to look at medical and medication causes of delirium, as these problems can often be reversed. Note that a large number of medication-induced "dementia" is caused by over-the-counter supplements and remedies. See the section in this website about Supplements under Prevention. Of course, alcohol use contributes and confusion and cognitive changes can often be dramatically improved if not cured with ETOH cessation. This is often called "ruling out the reversible dementias" and physicians employ laboratory blood tests and exam to do this. Sometimes a CT or MRI scan of the brain is done–not to confirm Alzheimer's as commonly believed, but to rule out reversible causes like tumor or to confirm stroke-decease related Vascular Dementia. By far most dementia is due to Alzheimer's especially as a person ages. What causes Alzheimer's is still a mystery, but we have hints and good ideas about a number of issues that probably have to come together to result in Alzheimer's. Of course, the older one gets, the more likely the effects of long-standing diet, medical problems, inherited and new gene mutations, and environmental exposure will coalesce into dementia. One such issue has been getting a lot of attention since 2005: Is Alzheimer's Type 3 Diabetes?